There are many reasons to either feed or not feed our birds. One of the things I miss MOST about having moved here from New Hampshire, is that I don’t have my string of feeders right outside the dining room window. It provided hours of enjoyment! Not only did we have birds there, we also had frequent squirrels and occasional black bears come for a handout. They could be annoying and sometimes a bit frightening. In New Hampshire I didn’t worry so much about the lawn, as our kids made us promise not to grow grass in our yard (they wanted to enjoy their hours there, rather than be cutting the grass!). Where we lived in Connecticut was a totally different story. We had a beautifully manicured lawn. When Spring came, the grass below the feeders was dead, covered with seed debris, and just an awful mess in general. It took a lot of elbow grease to get it back to where it should be. All that debris however, brings us to where this particular blog entry picks up. We now live in the midst of Seattle, Washington. We now are definitely to be considered residents of an URBAN landscape. So, if we have feeders, what happens to all of that debris???? It falls to whatever is below. 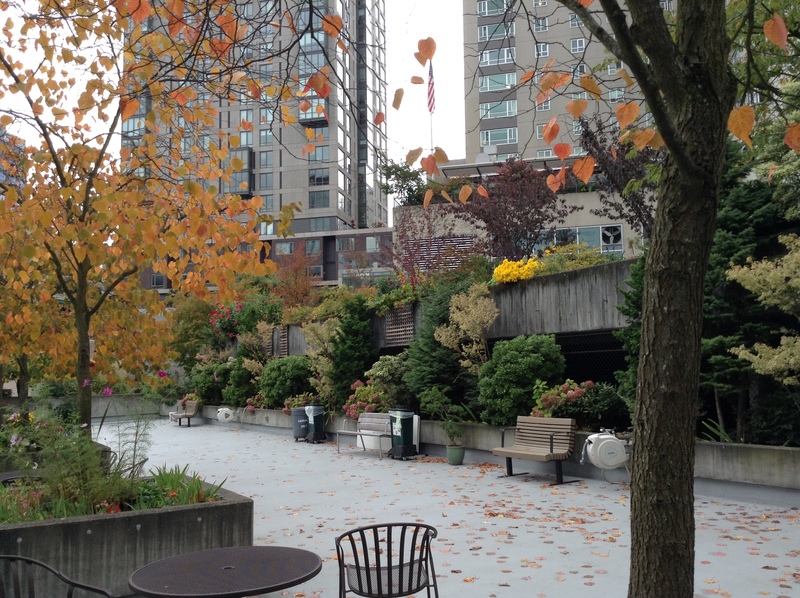 That might be someone else’s balcony, a green roof, the sidewalk, a terrace…on and on. I’m sure you get the picture. But, then what? If it’s someone’s balcony, they are pretty miffed as they end up having to do the cleaning. If they sweep it off the balcony…whoops…down below again! Or else they have to deal with your mess. That’s not really fair! Not only is it not fair, the debris AND the seed are a free handout to our local scavengers. Those might be squirrels, RATS, pigeons, gulls, etc. It also invites raptors (hawks, etc.) who prey on the visiting birds. And then there are the cats, who are the biggest enemy of birds at feeders, as I understand it. Here at Horizon House we are asked NOT to have bird feeders for just those reasons. I know we all miss seeing the birds, but we now live in the city, and we need to be kind to our human neighbors. We should also refrain from being “pigeon people”. One of those who save bread and feed it to the pigeons. It’s unhealthy for a whole lot of reasons. It is NOT nutritious for the birds, and again it attracts the wrong creatures to our midst. I would like to suggest that if you want to see some birds you might find a hummingbird feeder. There is no debris. You will get to enjoy the hummers. They are pretty speedy, discouraging those that might want to eat them! Should you decide on the hummingbird feeder, mounted with a suction cup to your window…be sure to remove the feeder when the window cleaner guy comes. It’s a sure-fire way to lose feeders, and make the window cleaners job a whole lot more difficult. SUCCULENTS DO NOT NEED MUCH WATER! Succulents! 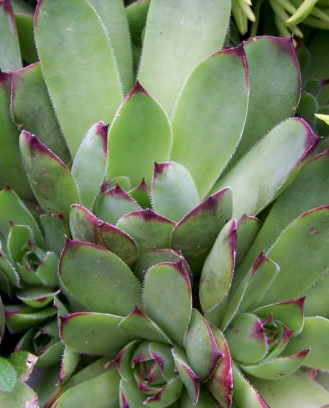 If you are concerned (which you SHOULD be) about use of water in your garden…think about planting some succulents. The picture I have here is of what I call “Hens & Chicks”. I had these guys planted in many corners of my garden! They were in stones, by the sides of steps, in gravel, in places where nothing else would grow. Here is a picture of some Hens & Chicks where you can see the little chicks peeking out from within the fleshy leaves of the mother plant. I would just gently pull these little guys out and stick their rootlets into the soil where I wanted them, and voila, before I knew it, I had a new “Hen” making her own “Chicks”! 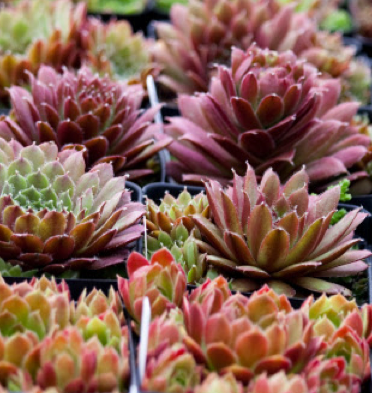 Succulents are plants that have evolved into what is called “Xerophytic”. What that means is that they do not need much moisture at all in order to grow. Their roots are extremely shallow, which allows them to take advantage of very light rainfalls. Their leaves absorb that liquid, creating the “fleshy” leaves, the liquid of which can be drawn on during extended periods of drought. Succulents can be indoor plants as well as outdoor plants. They are easy to grow, because of their seemingly total disregard for water. This makes for a GREAT (indoor OR outdoor) plant for a new gardener ! In this age of concern for use of water, there could not be a better choice! TRY them…you’ll LIKE them! Here at Horizon House, we are definitely IN an URBAN setting. Many of our gardeners here would like to have attractive vegetables growing in their raised beds, and on our gardening terraces. There are things to be cautious about with urban vegetable gardening, mostly with noxious air and also noxious things in the soil. Everything eventually gets into the soil, so it’s worth a bit of concern. I don’t think we need to worry as much as those who live locally, and attempt to plant veggies right at the roadside. Here at Horizon House, we have the benefit of using packaged soil or “compost” in our gardens. We do not just dig in local soil, as do many of our neighbors. BUT, there is still air, and rain borne chemicals that settle down into our soil. This morning I read an interesting article on my NPR Home page. It talks about what Washington, D.C. is doing concerning this. The University of the District of Columbia is supporting a study on urban farming, and is in fact, the ONLY Land Grant University that deals with a totally URBAN focus. This is GOOD stuff for the urban farmers within the confines of Seattle, and even the communities close by. 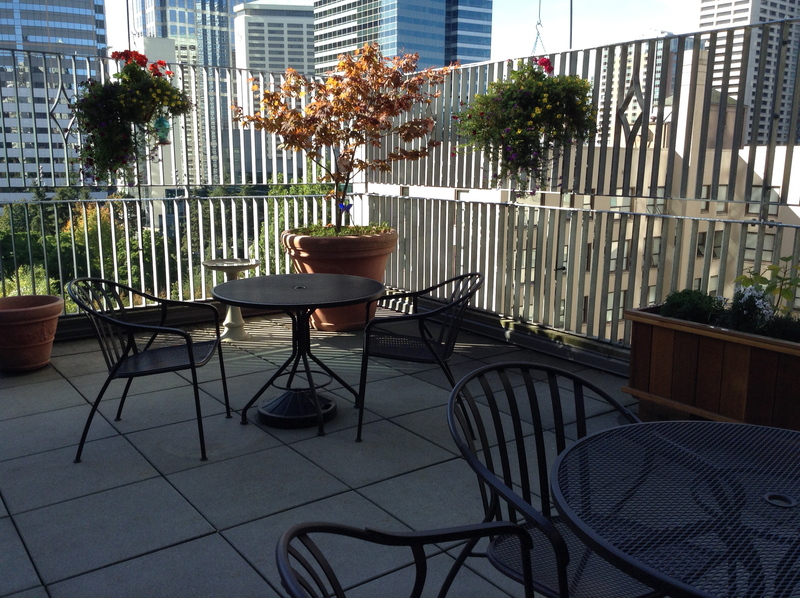 In our Gardening Terraces, some gardeners are growing pretty greens, little tomatoes, kale, etc. We also have an herb garden tended by two of our Garden Committee members. The herbs are available to ALL who live at Horizon House. It’s wonderful to be able to come down to the garden and pick nice, fresh herbs to use in our dinners and lunches. In fact, the Garden Committee has also sponsored an herb garden for our chef, right outside the dining room, so the menu can now boast fresh herbs in our food! 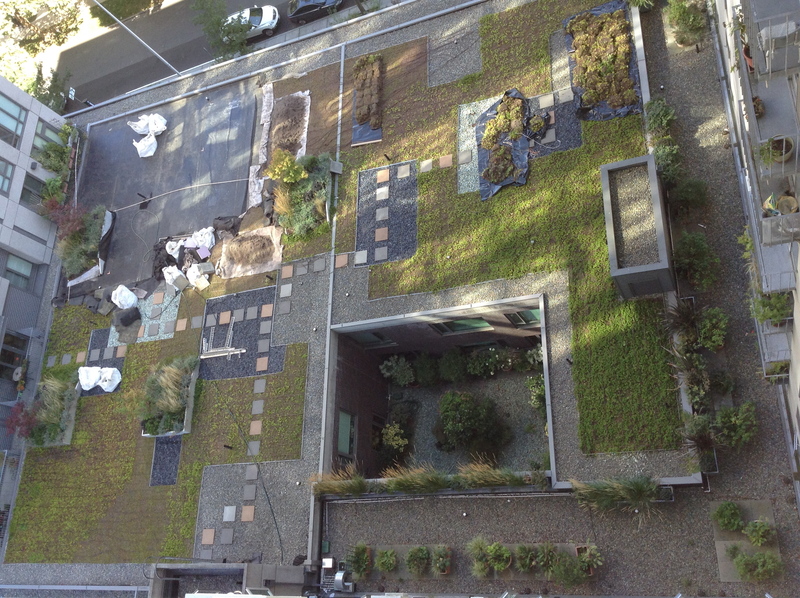 RAINGARDENS, GREENROOFS, PLANTER BOXES, WATER CONSERVATION! This morning I was delighted to read an article on NPR concerning various types of water conservation. I have been advocating the use of Rain Gardens for YEARS! I LOVE that the idea is catching on everywhere. It’s about time! 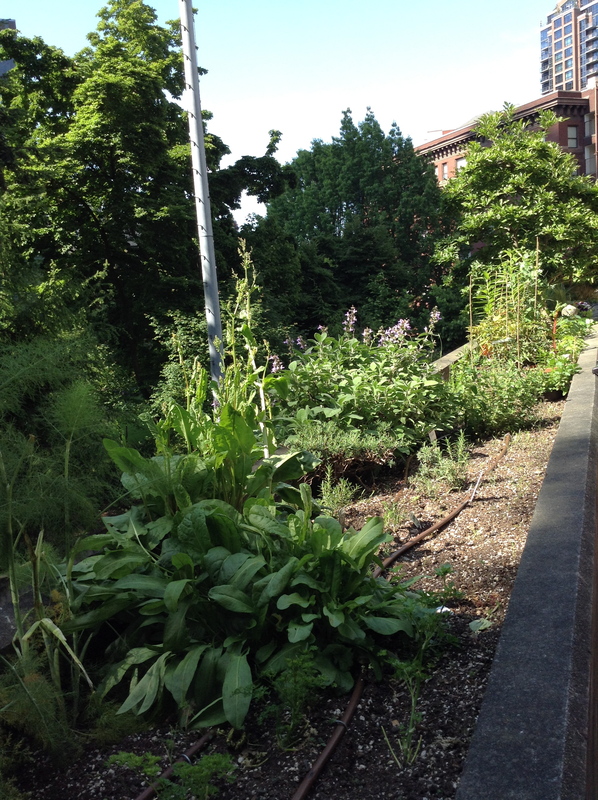 At any rate, aside from MY words, here is a web site that tells about ALL kinds of Green Infrastructure. Here at Horizon House, we should be proud that our building is home to a Green Roof! In fact, our apartment looks right down on that green roof. At the moment it is enduring some repair. Somehow it “sprung a leak” which is definitely NOT good, and not something you like to see, but even with that setback, being in the final stages of repair, it will soon be doing it’s job of keeping the rain, over our little corner of Seattle, from flowing into the drainage sewers! Our garden beds, on three separate levels, are also definite “rain catchers” as you can see in this photo. Ours is in an urban area, however raingardens can be utilized ANYWHERE! Those of you who live at Horizon House, be proud of your green roof, and be aware that we are on the cusp of something very good! Those of you who do NOT live here, maybe you should encourage your building administrators to see if this wouldn’t be something you could do to help our environment! If you live outside of the city, you have even a better opportunity to build something into your surrounding area. Instead of laying down asphalt the next time you need a new driveway, think of a permeable driveway!